As a board game reviewer, a frequent board game teacher, and a thrifty board game buyer, I read a lot of rulebooks. A lot, a lot, a lot of rulebooks. Which is a shame, because many of them are bad. I get it. Board games are part of a niche hobby, and there’s not a lot of money to be had in them, so investing a lot of time and money in a rulebook can seem like a fruitless venture. 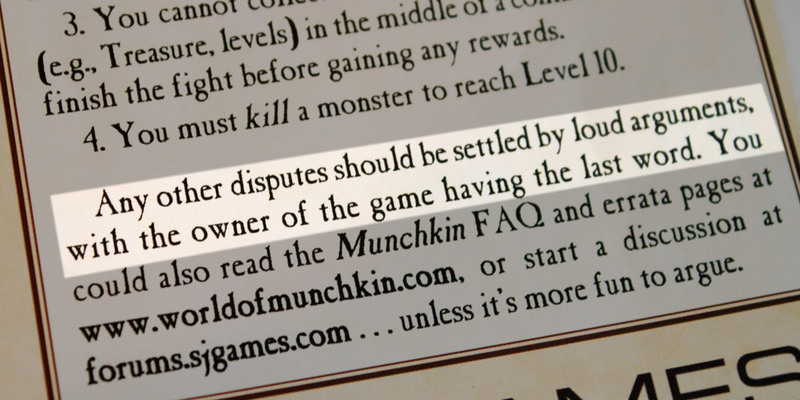 But my contention is that designers should keep in mind that rulebooks are the gateway to their games. If I can’t understand the rules (and despite my experience, that has happened before), I can’t play your game. And I’m more enterprising and forgiving than most. As we’ve seen again and again, what many of us consider easy hobby games to learn look like Twilight Imperium to the uninitiated. I’ve compiled a list of advice to consider as you write rulebooks for your games. Clarify the goal. Right at the beginning, players should know what it is they are trying to do. Are they trying to earn the most victory points? Be the first to get off the island? Give the player a big picture goal to aspire to. Inventory the components. Preferably with pictures. Similar to the list of supplies that comes with any prepackaged building project, an inventory helps buyers catalog the pieces of the game and ensure that everything is present. It also gives them an anchor to return to if, in the course of reading the rest of the rules, they don’t remember what a canal token, or a meeple, or a card type is. Include outlines (and mnemonics) where possible. This one is big for me. In reading rules, I appreciate discrete categories that organize the rules. If I can perform only one action per turn, it helps to have a map of what my options are. Along with this, mnemonics are helpful. For example, Dominion’s ABC turn structure is brilliant–it’s simple to remember and easy to teach. El Grande’s continual reminder that “The king’s region is taboo!” is a refutation of almost all “But what about…?” cases in determining whether a move is legal. Outlines and mnemonics help players remember how to play. Give examples to handle edge cases. Don’t take the easy way out, giving obvious examples of what cards and actions do. Most players will understand obvious moves and plays by reading the regular rules, but they won’t necessarily understand cases that conflict with obvious play. If you don’t illustrate edge cases, you’ll send players directly to the forums during or after their plays, which I can assure you, is annoying. Players want to have a handle on what they’re doing, so give them that handle. A great example of this is Glory to Rome. Glory to Rome is a complex game with lots of card combos and interactions, yet the rulebook offers helpful examples in its supplement of how cards interact together. Puerto Rico is a game that has similarly accounted for complex building interactions in its rulebook (despite some of its other faults). Highlight easy-to-forget rules. No, this isn’t a deal breaker, but this is something that sets apart great rulebooks from passable ones. Do everything you can to make sure players are playing correctly. If there’s a wrinkle in your otherwise pristine organization, call it out. Make sure readers don’t forget. One example of this is Ticket to Ride‘s wild draw rule, which interrupts an otherwise clean order of operations. This rule could easily be forgotten, but the rulebook calls it out clearly. Use humor sparingly, if at all. We’ve all been to concerts where “Shut up and play!” is the prevailing sentiment. When you’re more concerned about telling jokes than teaching rules, I’m thinking the same thing as at the concert. “Just the facts, ma’am.” Of course, there are some rulebooks that use humor well in a way that reinforces the rules and atmosphere of the game–Kill Doctor Lucky is the gold standard, in my opinion. But chances are you’re not as funny as you think you are. Omit needless words (but retain needed ones). Reading rulebooks takes time and effort that I’d much rather spend on other things. (No offense, but I’d rather read the prose of Dickens or other greats than the rules to your game.) So keep them brief. If you can reference other sections without restating rules, that is preferred. That being said, your rulebook should not be so sparse that any in-game wrinkle that arises has to be taken to the forums. Avoid sins of both commission and omission. Employ terms consistently. A thousand times this. If victory points are “prestige,” don’t slip back and forth. If “repel” and “ignore” have the same effect in game, then use one term or the other. No one wants to learn a language to learn a new game. Some degree of this is necessary in any game, but keep the keywords to a minimum, and above all, keep them consistent. Dominion is the best example here. Just a few key terms–Actions, Gain, Buy, Card–and they are used so consistently that even brand-new cards are easy to understand at a glance, and the rules explain them clearly if they forget. Offer diagrams when helpful. A picture is sometimes worth a thousand words. I don’t need pictures for everything, but they can be helpful, especially in games where spatial placement is important. In Oasis, for example, the diagrams clearly outline where players can place tiles and markers on the board. Organize information intuitively. There should be a flow to the rulebook that follows the natural way you might teach the game to new players (since this is effectively what you’re doing). You also want to place rules under headings where you think players will look them up. (A helpful diagram for this comes from Ed Marriott, designer of Scoville.). Also, while it may be novel to make your rules, say, islands on a map (…Jamaica, anyone?…), choose a layout that won’t upset readers and that will serve as a useful reference during gameplay. Consider supplementary helps. Some games have complex interactions or lots of unique cards or many terms to keep straight. Do you need a spoiler sheet that explains cards (as in Dominion or Glory to Rome)? Do you need a glossary that defines terms and keywords (as in Innovation)? Do you need an accessible setup guide or chart for different numbers of players (as in Power Grid)? Will players benefit from player aids (as in all but the most intuitive games)? Seek blind feedback. Approach people who know nothing about your game and ask them what questions they have after reading the rules. This will help you exit the echo chamber of your own biases and see the real gaps in your logic. Hire professionals. This may seem self-serving coming from someone who earns his family’s bread by professional editing, but seriously: hiring a professional is worth it. Professionals approach proofreading and editing differently than does the average Joe. Similarly, a professional graphic designer can help with organizing information visually to make reading your rulebook simpler. Don’t rely solely on your gut, and don’t rely on the mob. Sometimes it pays to use the experts. Belfort: Belfort is a game that has a lot of moving parts, but the rulebook does an excellent job of explaining them. The game seems simpler than it is, largely because of the excellent rulebook. Puerto Rico: Again, Puerto Rico’s rulebook isn’t perfect (typos and such), but the testing that went into the game is evident in how edge cases are handled. Every building has helpful clarifications right underneath its description, eliminating the need for supplemental online FAQs. Splendor: This is a recent find, but the rulebook is a mere four pages, which is almost unheard of for a strategy game. Granted, the game is on the simple side, yet I think this is a great example of a sparse rulebook that gets the job done. What about you? What tips did I miss, or which rulebooks do you find exemplary? I would only disagree with the one bout humor. I appreciate those attempts. Especially puns. Steam Park has a really humorous rule book that meshes well with the flow and structure of the rules overall – it is well done. Funny rules are great, if they’re funny. But out of, say, 100 rulebooks that try to be funny, 5 of them are hilarious and the other 95 are terrible and the bad humor just distracts from the rules. My favorite rulebook is from The Order of the Stick Adventure Game. It’s rulebook reads like a comic. It’s awesome! I think Dominant Species is a best in class rule book. The game is fairly heavy but you can learn it by reading the book without the components in front of you. Great article! This will definitely be helping when refining the rulebooks of my game designs.